It’s hard to even know what to say this week. The shooting in Orlando has left us all speechless. (Except for the brilliant Lin-Manuel Miranda, whose acceptance speech in the form of a sonnet he wrote that day is about the only response that has resonated with me all week. He announced this morning that there are now t-shirts with part of that speech available for sale, with profits going to Equality Cares in Florida, to help the families of victims.) I’m going to restrain myself saying anything more about this, for the moment. I’ve been thinking about teaching a lot lately. Having been a high school teacher, off and on, for a decade, I often think about education. Oh, we could use more education: more critical thinking, more connection, more questioning, and more listening. There can be profound moments in a classroom. And it’s those moments that make me miss teaching. I miss teaching lately. Going back to being a full-time high school teacher is not in my future. Too much grading. Not enough time writing. Also, this space would have to go quiet and I don’t ever want to do that. But I find myself looking for more and more chances to be in a classroom, leading discussions and helping in the ways I can. So Dan and i have been talking for the past few months about the kinds of interactions that mean the most to us. We’ve been thinking about what we have learned in the last decade. And we have been thinking about how we would like to help. We have created a schedule of classes for this summer. We have all the details and the links to register for these classes on this page. Click here for more information. We’d love to see you here, if you can make it. And if these classes are helpful to the people who take them here, then we are hoping to offer them online in the future. Let me know if you are interested in that. We are also doing private consultations, one-on-one, in person and via Skype. Please contact me at shauna@glutenfreegirl.com for further inquiries. We serve food at all of these classes, since food is one of the great uniters of this world. And it starts conversations. That’s what matters to me: these conversations. 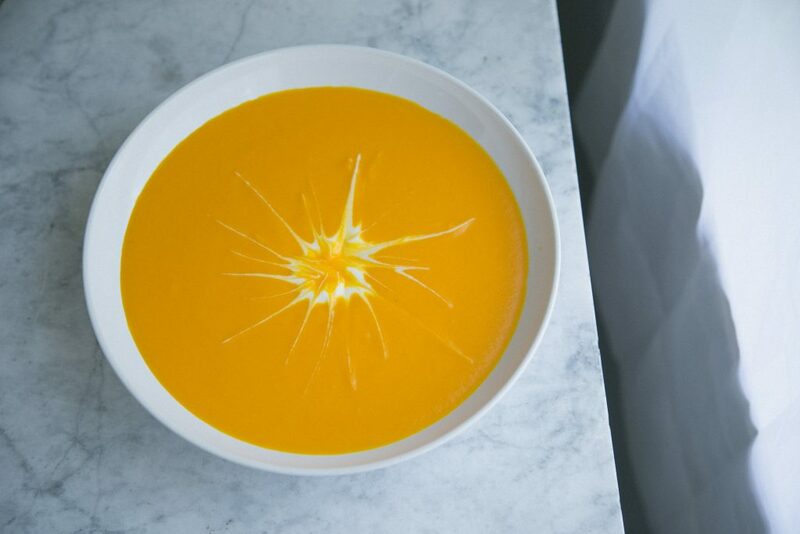 When things feel confusing and dark, we could all use a little light, even in the form of carrot-ginger soup. p.s. You may have noticed this if you have been on the site lately. We’ve updated our gluten-free flour packaging for you. We now have larger bags (3.75 pounds) for sale. And we’ve been listening to the many of you who have wanted to order but couldn’t because of the prohibitive shipping costs. Now? FREE SHIPPING. We hope it helps you to bake with joy. This time, I pinned him down on this carrot-ginger soup. Until I met Dan, I thought that soup had to be much more complicated than he makes it. I always made homemade stock (a mushroom stock from the Greens cookbook seemed to take days). He usually uses water. And when you think about it, homemade soup is about the least expensive way to make a lot of food, other than a big pot of beans. What really matters is the balance of flavors. And the slow simmering. This carrot-ginger soup is gently zingy, light enough for summer, and still satisfies as a meal. It’s good hot or cold. Top it with creme fraiche. Or use a non-dairy yogurt. Some toasted pumpkin seeds on top would be good. Mostly, make it for your family this weekend and you’ll have soup all week. Sauté the vegetables. Set a large pot or Dutch oven over medium-high heat. Pour in 3 tablespoons of the olive oil. When the oil moves easily around the pot, add the onion, garlic, celery, and carrots. Cook, stirring frequently, until the vegetables are softened, 10 to 15 minutes. Make the soup. Pour the vegetable stock over the vegetables. Add the turmeric. Cook, stirring occasionally, until the liquid has come to a boil. Turn the heat down to medium low and simmer the soup for 20 minutes. Add the chopped ginger to the pot. Bring the liquids back to a boil. Turn off the heat. Bring the soup back to a boil, then turn it down to a simmer. Season with salt and pepper to taste. Feel like playing? You can use chicken stock in place of vegetable stock if you want a heartier soup. 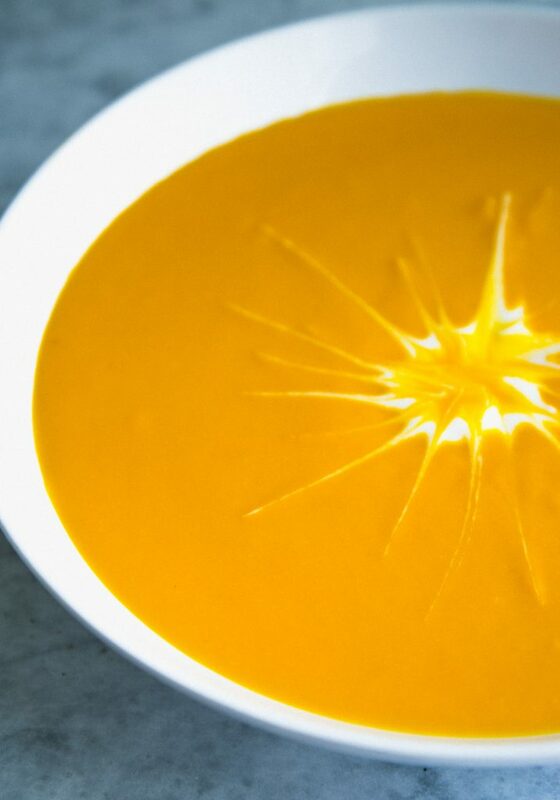 Using vegetable stock or water makes this a lighter summer soup. Try topping this with a dollop of creme fraiche or thick yogurt, if you can eat dairy.